Lock in a great price for InterContinental Warszawa – rated 9.2 by recent guests! Very cozy and staff was great! Quite a lot of options available at breakfast buffet. View from spa is amazing. The hotel itself is excellent. Spacious and clean room. Hotel smells very good. Cat parking service is excellent. The rooms was fantastic and very big, quiet. The Spa and pool incredible nice view. The bed and pillows were very comfy. The view from the pool was amazing. The hotel is in hearth of the city very good location staff are ok but could be better the hotel is clean and generally good hotel . Perfect location, spacious room and amazing views of the city from the room. Tasty and various breakfast options. 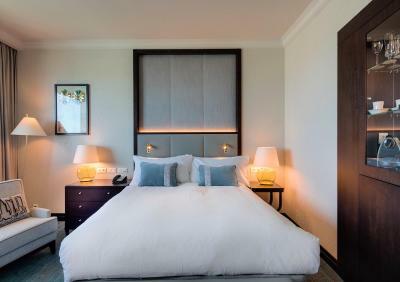 InterContinental Warszawa This rating is a reflection of how the property compares to the industry standard when it comes to price, facilities and services available. It's based on a self-evaluation by the property. Use this rating to help choose your stay! One of our top picks in Warsaw.InterContinental Warszawa is a 5-star hotel in central Warsaw, 1,650 feet from Warsaw Central Station. 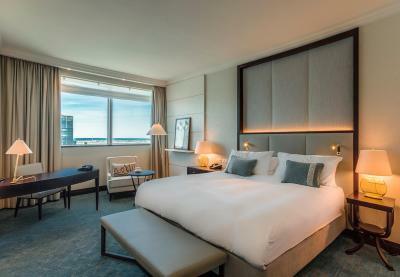 It features luxurious, air-conditioned rooms and a wellness center located on the 43rd and 44th floor. All rooms at the InterContinental are fitted with tea & coffee making facilities and a mini-bar. Guests can benefit from satellite TV and a safety deposit box. Some offer views of the Palace of Culture and Science. Guests can enjoy spending time in an indoor swimming pool or a hot tub, both with panoramic views of Warsaw. Additionally, the spa center offers a sauna and a steam bath. Some rooms offer access to the Executive Lounge with numerous benefits offered throughout the day. At the InterContinental guests can choose between 2 restaurants: Downtown Restaurant and the Platter, both specializing in modern Polish and international dishes. 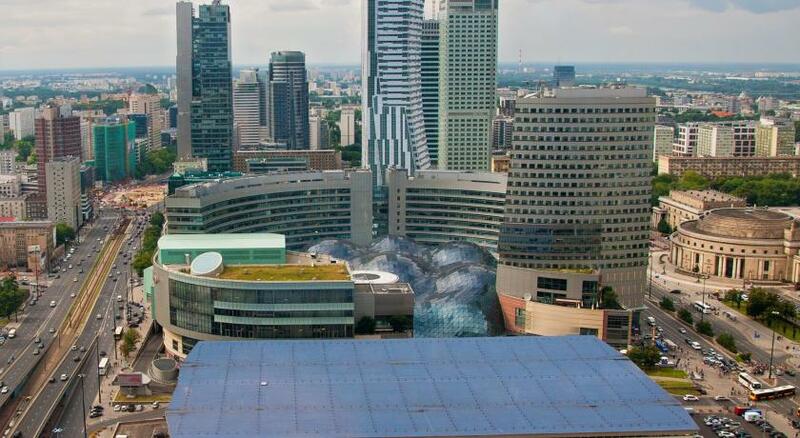 InterContinental Warszawa is located within a 10-minute walk of the Centrum Metro Station. The elegant shopping street of Nowy Świat is just one mile away. When would you like to stay at InterContinental Warszawa? An elegant room with classic interior design. It includes a satellite TV and a minibar. Complimentary tea and coffee-making facilities and bottled water is provided. Private parking is available on site (reservation is not needed) and costs PLN 145 per day. Guests staying in Club rooms can enjoy the benefits of the exclusive Club Lounge: private check-in and check-out, complimentary breakfast, drinks and snacks throughought the day and evening buffet. The Lounge provides a peaceful area for those needing to conduct business with the ideal atmosphere to relax, unwind and enjoy the spectacular panoramic views over Warsaw. This double room has a executive lounge access, air conditioning and satellite TV. This 5-star InterContinental invites you to take a dive "in the clouds" at the 43rd floor pool or dine at the award winning Platter by Karol Okrasa. 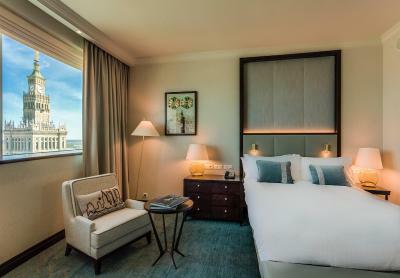 After a long day, marvel at the scenic Warsaw panorama from one of the 414 elegantly appointed rooms. House Rules InterContinental Warszawa takes special requests – add in the next step! One older child or adult is charged PLN 134.30 per person per night in an extra bed. InterContinental Warszawa accepts these cards and reserves the right to temporarily hold an amount prior to arrival. Children are welcome at the swimming pool until 19:00 from Monday to Thursday, and until 20:00 from Friday to Sunday and Bank Holidays. Children must remain under adult supervision at all times. Great location, beautiful rooms and nice pool. old amenities, and unfriendly staff. 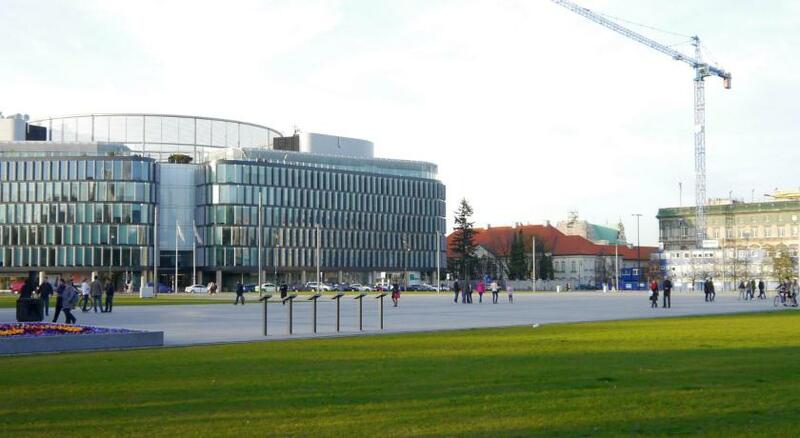 Location is good, close to the railway station and palace of culture and science. Great hotel, Large rooms. located at the city center. Good breakfast. The swimming pool at the 42 floor is awesome. Staff: although they do their job so professionally but they are not smiling at all. You feel unwelcome by them. I never saw anybody smile in this hotel although that I spends five nights except the guy at concierge disc . I like club lounge. It was very comfortable place. It has everything ( drink- food - computer - printer, ..) It is exclusive for Club rooms (more expensive room but it deserve) Concierge: was so helpful. Seemed impossible to get a taxi in the morning Staff were quite stone faced WiFi was very intermittent Room cleanliness really not intercontinental standard! If you pay 3 times more than the next door hotels you wish to get some value. Drillig for 2 hours noon time is unacceptable. The towels good but not for deluxe hotel standard. Bad value for money. Next time we try other 5 stars hotel. The concierge is fantastic very helpful the guy and the girl. The breakfasts very good. The location excellent. The swimming pool and the gym on the top floor very impressive. The pool in the morning and at night is surreal. The breakfast is superb. Thanks.